Club Sandwich readers regularly send in quizzes so fiendish that even you Fun Club readers would be seriously flummoxed. This time we have selected two - or three, really, as you will see - which give normal human beings a fighting chance. Answers are upside down at the foot of the page. 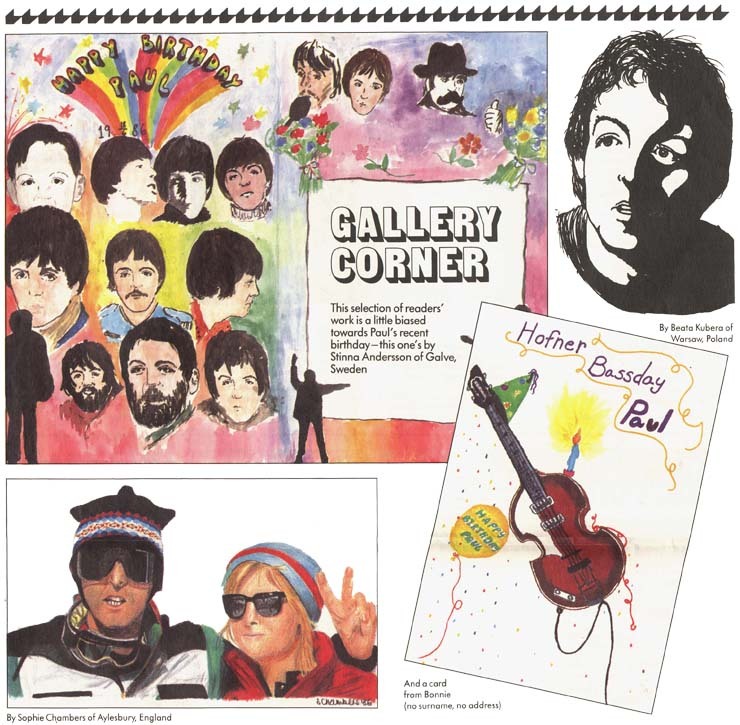 Let Robert Brown of Colchester, Essex introduce his questions: "For many years, Paul McCartney has been composing songs that contain names of characters, some of whom are real, others totally imaginary. Below I have listed 20 names, all of whom have appeared in songs that are directly attributed as being written by Paul. To test your knowledge of Paul's music, simply write down the title of the song in which the character appears." N.B. No. 10 is slightly off beam, but I think we'll forgive Robert in view of the 19 goodies. Kristofer Engelhardt of Bay City, Michigan and Amy McGrath of North Billerica, Minnesota were often very obscure, so we took the five best questions from each., the first five are Kristofer's. 1. What is "Kreen-Akrore", besides a McCartney song? 2. From where did Paul get the name "Mamunia"? 3. Which Wings album was issued promotionally in Britain as a boxed picture disc? 4. Why was Wings' US tour postponed? 5. Name the author and the book that inspired Paul to write "Bogey Music". 6. Name the place where Paul held auditions for a Wings drummer in 1974? 7. Which Wings LP became one of the first rock albums to be released in Russia? 8. Name the rock group sketched on the inner sleeve of Wings at the Speed of Sound. 9. "Name and Address" was a tribute to whom? 10. Name the album by Mary Hopkin for which Linda was the cover photographer. ANSWERS to No. 2: 1. A Brazilian Indian tribe. 2. It was the name of a house in Lagos, Africa. (At a later date Paul and Linda stayed at a hotel with a similar name but different spelling, which lead to a misconception about its origins.). 3. Bade to the Egg. 4. Jimmy McCulloch's injured finger. 5. Raymond Briggs - Fungus the Bogeyman. 6. The Albery Theatre, London. 7. Band on the Run. 8. Ian and the Kilburns (alias Kilburn and the High Roads with Ian Dury). 9. Elvis Presley. 10. Postcard. CLUB SANDWICH No. 41 © MPL COMMUNICATIONS LTD 1986 ISSN 0262-9054. PUBLISHED BY WINGS FUN CLUB, PO BOX 4UP, LONDON W1A 4UP. DESIGNED AND PRODUCED BY ROGER HUGGETT/SINC. REPRO BY MAGNET LITHO. PRINTED IN THE UNITED KINGDOM BY PENSORD PRESS.